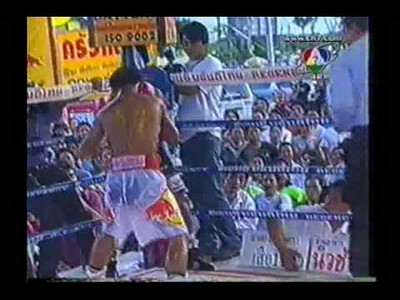 Continuing Songchai’s Olympic heroes series Samson Formerly Elite Gym and 3K Battery, fights Langsuan Phanyvthtaphum. In this video Samson is erroneously labelled the IBF champion. Samson instead spent his entire boxing career fighting for the lowly regarded World Boxing Federation (WBF). As a world champion Samson was completely undefeated ending his career with a 43-0 record but actually never participated in Olympic boxing. Langsuan Phanyvthtaphum was voted the best boxer of 1987 and held Lumpinee stadium titles in 2 weight classes: 108 lbs. and 115 lbs. Because of his hard knee attacks and aggression Langsuan was nicknamed “Mr.Mean”.